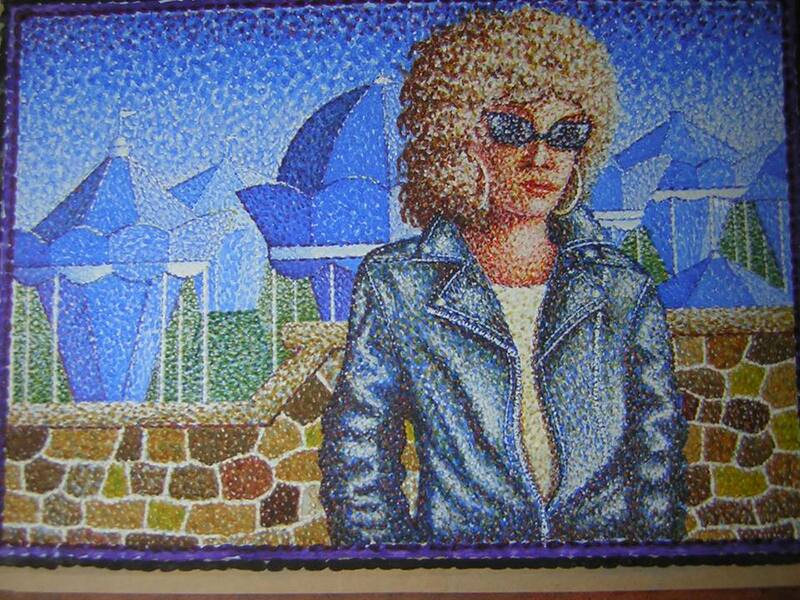 Mick Wilson is a talented artist who lives on Darfield Road in Cudworth. 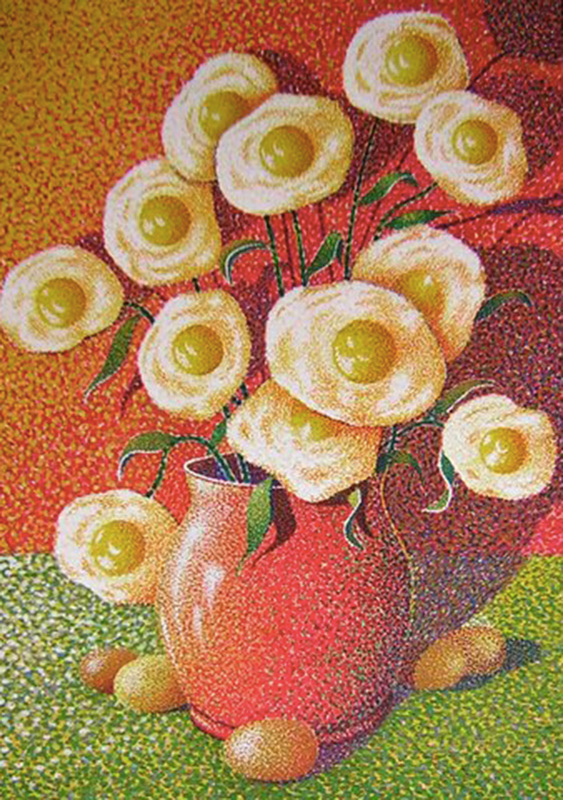 His forte is pointillism, the art of painting in small dots of pure colour. Visit Cudworth spoke to former mineworker Mick about his art and life. 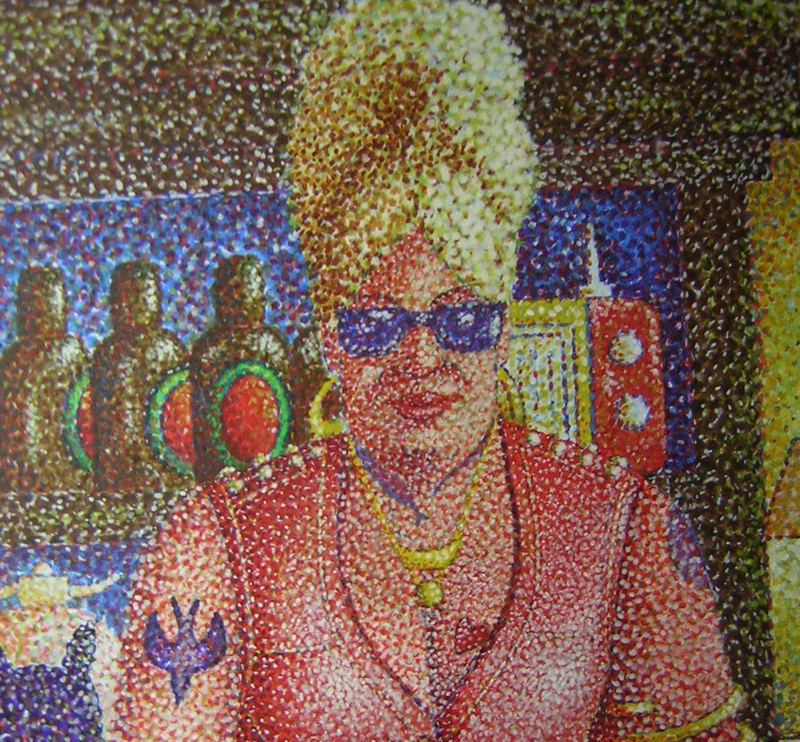 I left school with no qualifications and worked for several years at Grimethorpe colliery then for several more years at an engineering plant in Barnsley, Wilson (no relation) and Longbottom’s and to cut a long story to shreds in 1990 I went full time at painting after `getting into` Pointillism which is the technique I use which is basically painting with small dots and dashes of colour. I should really change my name to Mick Morse! My day begins around 5.15am when I drag myself away from wrestling with the duvet, then a reviving cuppa, read a little then begin painting or drawing around 6-15 . On Monday though I co-run Top Draw Life Drawing in Barnsley with my great mate Suzy Brumby and Thursday evenings I attend life drawing at Westgate Studios in Wakefield. Both are really great at sharpening your drawing and observation skills, great socially as well. I’ve made some fab friends at both and most importantly for me… they’re really good fun. I’ve had some great memorable responses to my work including being featured on TV and radio plus countless interviews in newspapers etc. But the most memorable for me was once, some years ago, I was doing a talk to some school children aged around 12 years when one boy who had been looking intently at my dotty paintings suddenly looked up and said, “I like your paintings Mr.Wilson, I think they are better than proper paintings”. For once I was lost for words… what a compliment… unbeatable! The artistic life is lonely in the respect that I like to paint on my own but as I’ve said, the fantastic friends I’ve made through art fill my life plus when I’m painting my head is full of thoughts for other pictures that you don’t have time to feel alone. Too many characters in my head asking to be released. I research the work of the Impressionist painters and Georges Seurat who `invented ` pointillism but sometimes I wish someone would research me and let me know who I am. How do you work and what media do you use? 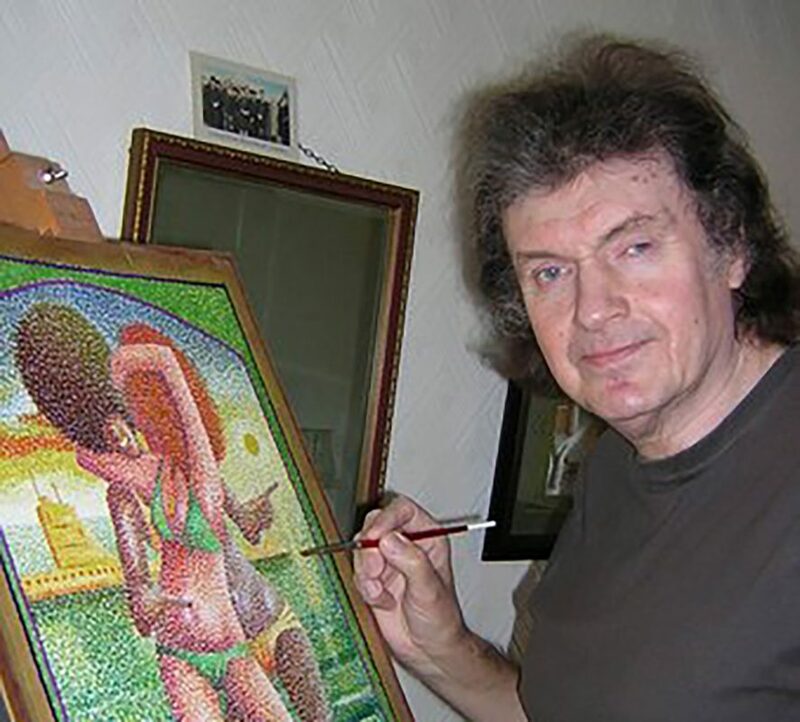 I used to paint in oils but I painted my first pointillist picture in watercolour and found that this medium was 3 times faster than oils so I adopted watercolour and adapted it to an oil painting technique in that I use a little water and a lot of paint. A writer friend of mine who bought some of my work said to her friends that she gets a lot of paint for her money. Besides this medium is also 3 times faster in preparation, cleaning up after a day’s painting and more storage space so what’s not to like? Do you rage against the machine or use computers to create your artwork? I don’t rage against any machines nor do I ever use computers in my work. I don’t use a ruler to draw a straight line either coz for me, if I don’t create a painting or drawing just using my eyes and fingers and imagination (and paints, brushes and pencils) I would feel I’ve cheated a bit. Which other artists/designers/real-life situations inspire you? The artists who really get to me are of course Seurat, Stanley Spencer, Modigliani, Jack Vettriano and all the unknown, genuine honest to goodness artists working away in their bedrooms, attics and cellars. Those who draw and paint because they love it and have to through that love of doing it and my inspiration comes from the streets, on buses and trains, in pubs and cafes ……everyday people doing everyday things . What links do you have to Cudworth? I was born in Cudworth but have lived and worked in other places and now live and work here with a great view of a grassed over slag heap that used to be part of Grimethorpe colliery. It looks very rural but we know what lies beneath . My dream project is to have fun so I’ve achieved my dream. My professional goal is to be as un-professional as possible but that would be too easy for me as I`ve always been impressive with my un-professional approach to art but I muddle through. The superpower I would like to have is not breaking the yoke when I fry eggs . Mick’s demo’s are AWESOME. Entertaining, informative, imaginative and vivid. I was at an event in Wakefield (the Art walk, it runs every other month on the last Wednesday of the month) and a fellow, whilst browsing commented to his companions on some postcards we were selling of Mick’s work that he’d seen Mick’s work at the Cooper Gallery in Barnsley and felt it was one of the best works he’d seen…..little realizing that the man himself was by his side. He was chuffed to bits to meet the artist and the artist was equally chuffed – and as modest as you like. Lovely bloke.